D=80mm/H=225mm, Nutritional Oil Bottle 1.000 ml, inside gold and outside matt silver lacquered. The Oil Bottles are delivered inclusive non-dripping oil spout closures with genuineness seal. Punching = 27 mm. 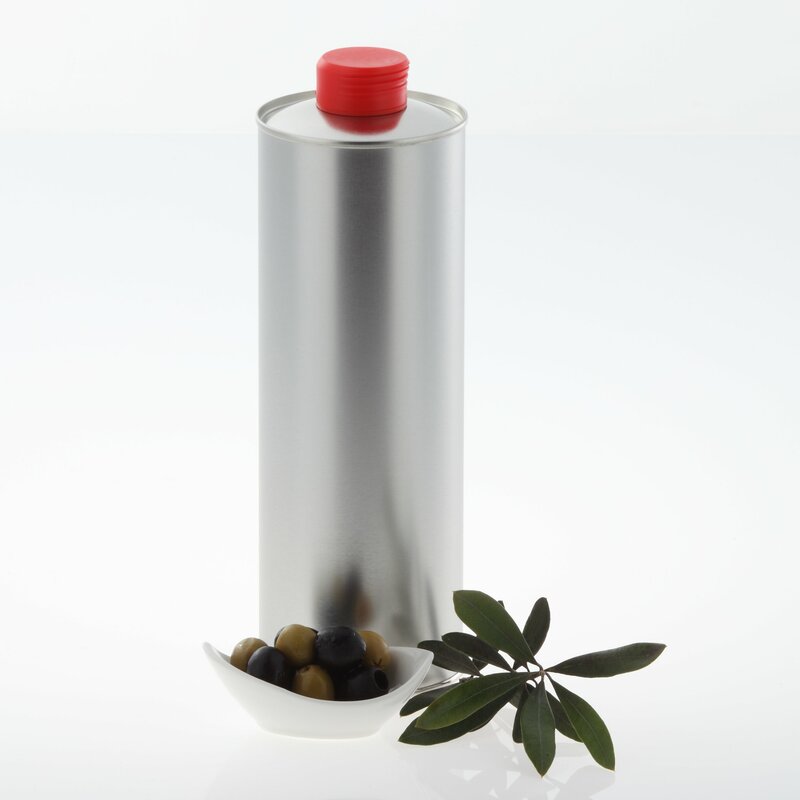 Our Oil Bottles are especially designed for cooking oil and therefore the perfect packaging for edible oils. The bottles offer an elegant packaging solution for your high-quality olive oil, rapeseed oil, pumpkin seed oil and much more. The Nutritional Oil Cans are made of tinplate (tinned sheet steel). The Oil Bottles are inside gold and outside matt silver lacquered (bottom and top silver). The curved top of the bottle ensures a very good residual emptying. The bottles are produced in compliance with food law regulations and are therefore ideally suited for food. Our oil bottles are impervious to light and air-impermeable. Our Nutritional Oil Cans are delivered incl. non-dripping oil spout closures with genuineness seal. Our Nutritional Oil Cans ensures optimal reclosability through the spout closure. The oil spout closures are available in the following colors: black, brown, olive green, bordeaux red, yellow, green, red and white. Please select the desired colors when ordering!